Seven boats took to the water on Thursday for the 3rd of 5 racing evenings. 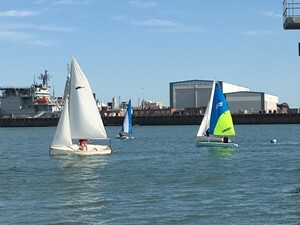 Two short windward/leeward races were run from a start/finish line at the RN Watersports Activity Centre (RNWAC) pontoon. Conditions were again ideal with a gusty Force 4 Easterly breeze and plenty of sunshine. Cdr Andy Wood (Laser Radial) extended his series lead with 2 narrow victories (11 seconds and 3 seconds ahead on corrected time) with Pat Smythe (Bosun) and Cdr Gavin Marshall (Pico) each taking a 2nd. Anthony Boddrell (single handed Bosun) finished 4th in both races while 5th place was hotly contested between Musician Brian Tregaskes (Fusion), Cdre Ian Annett (Laser) and Lt Cdr Ian Watson (Fusion). Six races of the 10 race series have been sailed so far - with up to 4 discards available (depending on number of races) the competition remains wide open with only 6 points separate 3rd and 6th places. Even if you haven’t raced yet, there’s every reason to come down and join in with the final 2 evenings on Thursday 12th and Thursday 19th July. The race brief will take place shortly after 1700 so aim to arrive around 1630 and rig prior to the brief. Additionally the Baring Cup takes place next Wednesday 4th July - any dinghy with a PY is eligible to enter including private boats. By popular demand, Ken Bichard is back to run the racing and 5 boats have so far entered. Race brief at 1400 with first warning signal 1500. To book a boat for any of the above events email RNSA(P) Dinghy Rep Lt Matt Irwin on navyoptrg-mwswsntun3@mod.uk. Hope to see you on the water!